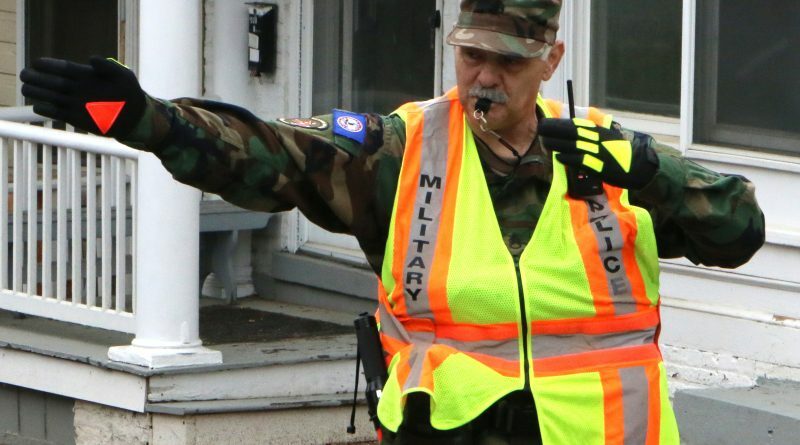 WINCHESTER, Va. — Nearly 100 members of the Virginia Defense Force assisted local law enforcement keep traffic moving during the 89th Apple Blossom Festival April 29-30, 2016, in Winchester, Virginia. VDF troops from each of the four regiments came together to form Task Force Shenandoah and volunteered their time by operating traffic control points and providing mission command support at the event. The Shenandoah Apple Blossom Festival is a series of more than thirty events held in Winchester and Frederick County including band competitions, dances, parades and a 10K Race. Crowds in excess of 250,000 attend the festival each year. In addition to the traffic control assistance, Watson said VDF leaders have also helped with contingency planning for this year’s festival and plan to continue to develop those plans in the future. In addition to providing service to the community, VDF service helps troops build skills they can take back to their civilian jobs. Felton credited the classroom training he has received as well as the camaraderie with his fellow VDF troops and leadership skills from his superiors for improving his management skills in his civilian job. Members of the VDF perform a similar function for the Virginia War Memorial in Richmond when they volunteer their time to assist with traffic control during Memorial Day and Veterans Day events, and they will provide similar support at the Lynchburg Air Show in May.